Tim Clayton - another Award winning callmaker- has generously stepped up for a donation for the cause. We thank you Tim !!! Here's another gracious member donating for the chase- Doug Morgan(Morgan) has stepped up to donate one of his rare pot slate calls !! Thanks Morgan for your kindness- we appreciate it a lot ! 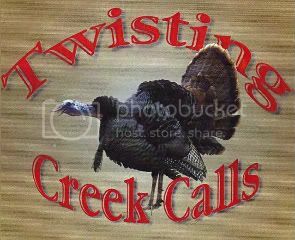 and still another callmaker guys....here's a special donation form another of the GRAND ole masters guys...a Florida resident who has artfully been creating calls for quite some time--Charlie Parrish has graciously donated one of his calls to help our event. Charlie, we all appreciate the participation and look forward to what you do for us. another Great announcement---Pat Strawser--another Award winning callmaker has generously donated one of his great pot callers for Osage. Richard Hudson has genorously donated one of his calls for the sites causes !! thanks a lot Austin...everyone here at the Roost appreciate your kindness donating to the cause . another great maker and member has joined in for the common goal--Guy Ruble has agreed to make us a call for the event also---we all appreciate your generosity Guy and look forward to seeing what you create for the auction. L.T. Pack has joined the contributing members here to donate one of his very limited creations. L.T. has very creative styling and inlay in all of his work---cannont wait to see and hear what you create for the benefit L.T. Jeff, when do these need to be in?? Thanks buddy, I should have it in the next two or three weeks. Count me in, y'all. I will get a MISSISSIPPI SCRATCH BOX out to ya in a couple of weeks, Jeff.